Antibiotic Resistance is a term that appears to be like some super terms used in some science fiction movies. 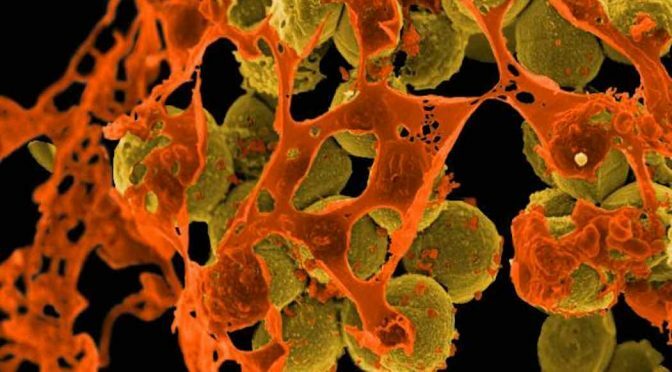 But this term is something of which we should be afraid of because antibiotic resistance and spread of drug-resistant pathogens are one of the most serious and dangerous threats to public health in this 21st century. Antibiotic resistance is generally defined as a type of drug resistance in which some microorganisms, commonly a bacterial species, develop tolerance and are able to survive after exposure to one or more antibiotics. There are many sources of drug resistance and some of them are listed below. Spontaneous mutations in the bacterial chromosome can make a bacterium resistant to the antibiotics. Generally, such mutations result in a change in the target enzyme or cellular structure; therefore, the target is no more susceptible to the drug. In many countries, drugs are available to the public without any prescription; people may take antibiotics on their own prescription and which may further increase the prevalence of drug-resistant strains. Most antibiotics are prescribed without properly culturing and identifying the pathogen. This favors the development and spread of antibiotic-resistant strains because the antibiotics destroy susceptible bacteria that would usually compete with drug-resistant strains. The result may be the emergence of drug-resistant pathogens. Toxic, broad-spectrum antibiotics are sometimes given in place of narrow-spectrum drugs as a substitute for culture and sensitivity testing, with the consequent risk of dangerous side effects, opportunistic infections and the selection of drug-resistant mutants. These situations are made worse by patients when they do not complete their course of medication. When antibiotic treatment is ended too early, drug-resistant mutants may survive. The use of antibiotic in animal feed is undoubtedly another contributing factor to increasing drug resistance. The addition of low levels of antibiotics to livestock feeds raises the efficiency and rate of weight gain in cattle, pigs, and chickens. However, it also increases the number of drug-resistant bacteria in the animal intestinal tract. The uses of some specific farmyard antibiotics are the main cause of the resistance of bacteria to some antibiotics. For example, Avoparcin resembles Vancomycin in structure and Virginiamycin resembles Synercid. There is good circumstantial evidence that use of these two antibiotics in animal feed has lead to an increase in Vancomycin and Synercid resistance among Enterococci. Previous PostWhat is Eutrophication? What are its Causes & Effects?Next Post11 Industrial Products that are derived from Microbes.